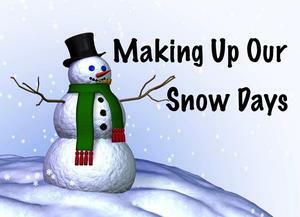 For a complete listing of School Age and LEX snow make-up days, click the title above. The Snow Makeup Day for January 24th is April 22, 2019. The Snow Makeup Day for January 30th is June 5, 2019. The Snow Makeup Day for January 31st is June 6, 2019. The Snow Makeup Day for February 12th is June 7, 2019. The Snow Makeup Day for January 30th is June 4, 2019. The Snow Makeup Day for January 31st is June 5, 2019. The Snow Makeup Day for February 12th is June 6, 2019.